EAGLE — A jury found Craig Miller not guilty Wednesday of menacing his neighbors after he felt they interfered with his son’s arrest in July for allegedly starting the Lake Christine Fire. The jury deliberated for about 80 minutes in the Eagle County Courthouse before reaching the verdict. Miller was charged with intent to commit second-degree burglary, two charges of menacing and criminal trespass. The burglary charge was a felony. If he had been found guilty, Miller could have been sentenced to one to three years in prison. The other charges were misdemeanors. In a statement issued after the verdict, Fox built off that theme. 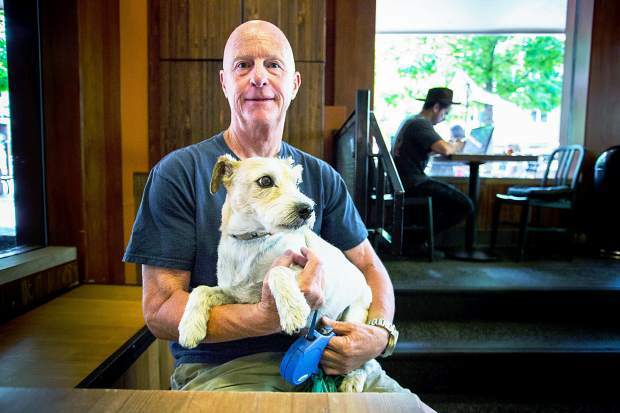 “Craig Miller always maintained his innocence. 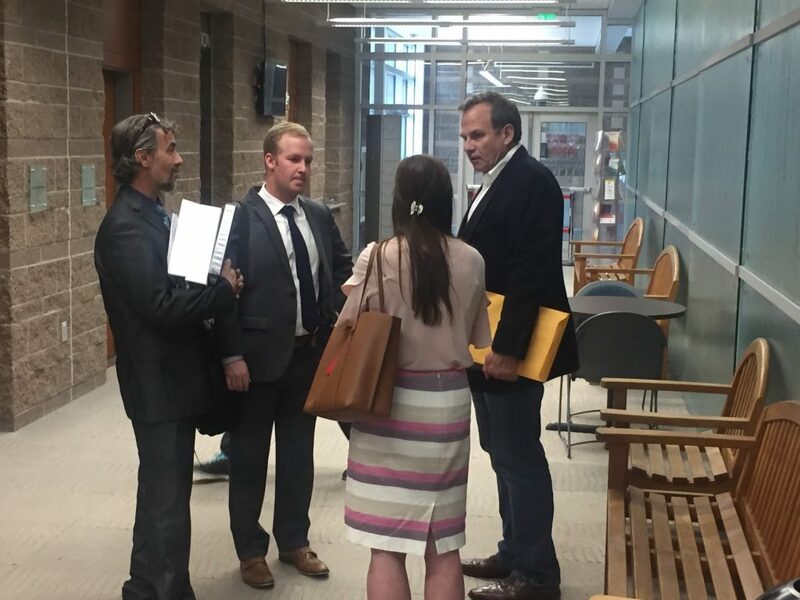 We appreciate the time and thoughtfulness from these twelve Eagle County jurors to vindicate our client,” the statement said. Miller’s defense relied almost entirely on his own testimony. He took the stand for about two hours Wednesday explaining why the events of Saturday, July 14, at the home he then rented in Missouri Heights upset him so much. Miller’s son, Richard Miller, and Richard’s girlfriend, Allison Marcus, had warrants issued for their arrests earlier in July for charges related to the Lake Christine Fire. 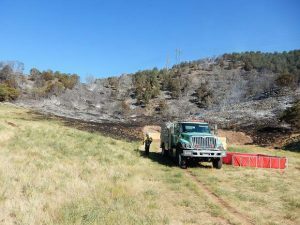 They allegedly shot tracer rounds at the Basalt State Wildlife Area shooting range late in the afternoon of July 3 and ignited dry grasses and brush. The fire charred about 12,500 acres of land, destroyed three houses and forced the temporary evacuations of thousands of residents. The firefighting cost was estimated at $17.1 million. Richard Miller’s trial is scheduled for May 28-June 7; Marcus for June 17-28. An attorney for Richard Miller and Marcus arranged with the district attorney’s office for the suspects to turn themselves in for arrest at Eagle County Jail on Monday, July 16, according to testimony in the two-day trial. Craig Miller testified that he was looking forward to a family gathering at his home on the weekend before Richard and Allison had to “deal” with the charges. Those three along with Craig’s other son and his girlfriend as well as Craig’s 74-year-old mother prepared a late dinner together that Saturday night. Craig went to bed at about 9:45 p.m. and was awakened later by voices. 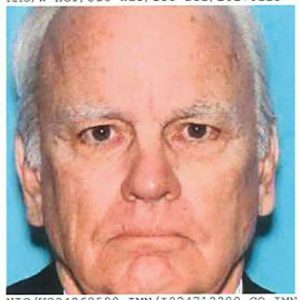 After showering, he investigated and found out two Eagle County deputies had sought entry to the house to search for Richard and Marcus after getting a tip they were at the home. The deputies were gone by the time Craig Miller got out of bed and showered. Richard Miller and Marcus had hidden from the deputies and were still at the home as events unfolded that night. Craig testified that he was particularly upset because he had spoken to a detective from the Eagle County Sheriff’s Office earlier in the week and explained the surrender agreement. Miller felt he got a commitment that the sheriff’s office would honor the surrender agreement. When the deputies were at his house that Saturday night, Miller’s first action was to call the detective shortly after 11 p.m. to ask him to call the deputies and “get the people to stop harassing us,” he testified. He got the detective’s voicemail and left a message that said he didn’t trust him anymore. Next, Miller headed out from his house to try to find the deputies who had been at his house. He found them a short distance away and approached two police vehicles. He admitted feeling “frustrated, exhausted and stressed out” when he talked to the deputies. A big part of the stress was from protectiveness for his son and his son’s girlfriend. He engaged the deputies in conversation about their efforts to enter his house. “I’m saying, ‘Are you aware of the arranged surrender agreement and if you are, why are you here?’ ” Miller testified. He said the deputies told him they had an obligation to act on a tip. Miller remained frustrated and called 911 in an effort to get the name of the deputies’ supervisor so he could complain about their conduct and get them to stop pursuing his son and Marcus that weekend. “They’ve gone rogue. They’ve gone rogue. They’ve gone rogue trying to help their reputations,” Miller told the dispatcher. While talking to their supervisor a short time later, he concluded the tip came from a neighbor. What happened next was at the center of the dispute during the two-day trial. Neighbors Joseph Lewis and Jocelyn Terry testified Tuesday that Miller banged on their door, shined a flashlight in their windows and entered their gated backyard. In a 911 call played at least twice during the trial, Terry sounded terrified about a man trying to enter their house. But Miller testified he simply wanted to explain to his neighbors that his family had made a deal that would allow his son and Marcus to turn themselves in on Monday and that his family just wanted to be left alone that weekend. He insisted that he never banged on the door at the house of Lewis and Terry, never attempted to enter the house and didn’t enter the yard. Deputies responded to Terry’s 911 call. Craig Miller was arrested. Richard Miller and Marcus surrendered a short time later. In closing arguments Wednesday, Chief Deputy Joe Kirwan of the Fifth Judicial District Attorney’s office portrayed Miller as angry and vindictive when he went to his neighbors’ house. “We all know, we heard the phone calls, he was peeved,” Kirwan said. He contended that the trial proved Miller was guilty of all four charges beyond a reasonable doubt. “I’m going to suggest there isn’t any doubt in this case,” Kirwan told the jurors. The testimony was 180 degrees different. If the jurors believed Miller’s testimony, they should find him not guilty. If they found the neighbors more credible, they should find Miller not guilty. Fox countered Miller was stuck in a bad position because the surrender agreement wasn’t shared throughout the sheriff’s office, the neighbors were unaware of the agreement and, because of a lack of information, the neighbors’ concerns might have been exaggerated. “This case is riddled with reasonable doubt because Craig Miller is innocent,” Fox said.